Index on Censorship and Osservatorio Balcani e Caucaso are launching mediafreedom.ushahidi.com to track media violations in Europe. 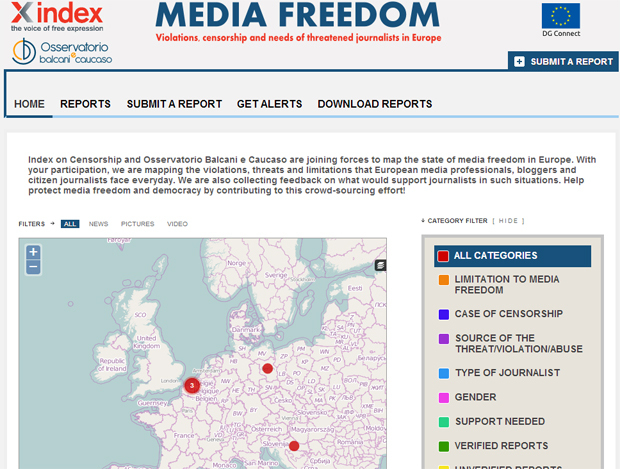 Index on Censorship, (London, United Kingdom) and Osservatorio Balcani e Caucaso, (Rovereto, Italy) have launched mediafreedom.ushahidi.com, a website that will enable the reporting and mapping of media freedom violations across the 28 EU countries plus candidate countries. The platform will collect and map out crowd-sourced information from media professionals and citizen journalists across Europe over the course of a year. Based in London, Index on Censorship is an international organisation that promotes and defends the right to freedom of expression. Since its founding in 1972, Index has used a unique combination of journalism, campaigning and advocacy to defend freedom of expression for those facing censorship and repression, including journalists, writers, social media users, bloggers, artists, politicians, scientists, academics, activists and citizens. “Index believes that free expression is the foundation of a free society and this website will enable journalists to report incidences of violations as soon as they happen. By mapping these reports online, the entire system will act as an advocacy, research and response tool, highlighting that violations on media freedom still occur in Europe.” explained Melody Patry, Index on Censorship senior advocacy officer. Osservatorio Balcani e Caucaso (OBC) has been reporting on the socio-political and cultural developments of South-East Europe since 2000. Through the online platform, OBC will monitor and document media freedom violations in 11 countries, among which Bulgaria, Croatia, Greece, Romania, Serbia and others, and collect the needs of journalists under threat. “We aim at improving the working conditions of media professionals and citizen journalists in Italy, South-East Europe and Turkey and ultimately at enhancing the quality of European democracy,” said Luisa Chiodi, scientific director of OBC. This new website is part of a European Commission grant project under the EU’s Digital Agenda (DG Connect). In light of remaining violations to media freedom and plurality in Europe, and longer-term challenges in the digital age, the DG Connect launched a call for proposals to address the issue. The successful candidates- the International Press Institute, Index on Censorship, Osservatorio Balcani e Caucaso together with SEEMO, Ossigeno per l’Informazione and Dr Siapera, as well as the European University Institute in cooperation with the Central European University– will spend the next year working on four projects, under the title European Centre for Press and Media Freedom. For more information on the projects and the website, please read EU project to explore media freedom and pluralism or contact Melody Patry, [email protected], +44 (0) 207 260 2671 or OBC, [email protected].